Rodents can carry a wide variety of diseases transmissible to humans. 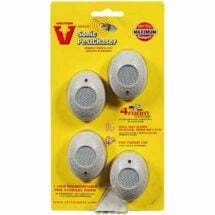 Learn how to get rid of mice FAST using proven, organic and natural control strategies. 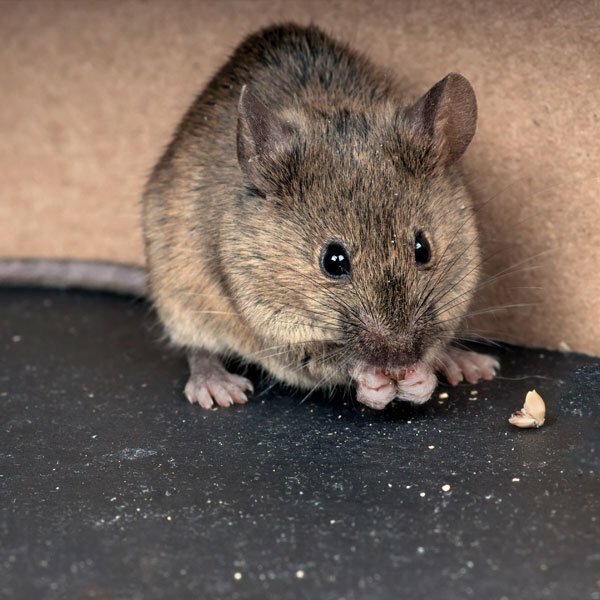 Mice are important rodent pests that often enter homes and warehouses for food and shelter. These rodents eat any kind of food meant for humans, pets, livestock or other animals. They also contaminate 10 times as much food as they eat with urine, droppings and hair. A very real problem with the infestation of mice is the Hantavirus which has been a threat in the arid southwestern part of the country. Another major problem is salmonellosis which is transmitted by these rodents and is a concern in food storage and preparation areas. The common house mouse is brown to gray in color with the tail as long as the body. Adults are small and weigh only about 1/2 ounce. Their droppings are dark colored, 1/8 inch long and rod-shaped. These rodents have a very prolific reproductive system breeding year round and having as many as eight litters annually. Females can start having their litters at the age of 1-1/2 to 2 months old. Life expectancy is no more than one year. Mice are tenacious in their ability to enter a dwelling and only need an opening the size of a dime. Thorough examinations need to be made periodically to assure that all points of entry (foundations, utility pipes and wires passing into the house) are secure. In those areas that are not secure, wire mesh or quick-drying cement can be used to plug cracks around drainpipes and other small areas of entry. Also, galvanized window screening can be balled and stuffed into larger openings that are then finished with caulking or cement. Expanding-foam insulation can also be used for filling small to medium size openings. A clean uncluttered home will make it hard for mice to find hiding places and food. Immediately sweep up crumbs and keep edibles and garbage in mouse-proof containers (metal or heavy-duty plastic with tight fitting lids), or in mouse-proof cabinets (including the refrigerator). Early fall or winter is the time of year when rodents move in as part of their normal movement patterns. 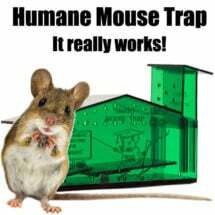 Mice can be humanely live-trapped and put back outside in their own environment. The use of snap and glue traps is also very effective. 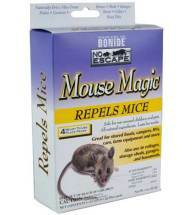 For best results, place them every 2-4 feet apart where rodents are seen or pest activity is suspected. High traffic areas include room perimeters (along baseboards), kitchen counter tops and behind cabinets and stoves. Attractant: Place a small amount of cheese, bread and butter, small nuts, cherry pits, sunflower or similar seeds in/on traps. Peanut butter, oatmeal and gumdrops are also highly recommended. Least-toxic baits work well when pests are plentiful. Agrid3 Bait is approved for use in organic production and contains no secondary hazards — will not harm pets or wildlife that catch/eat rodents poisoned by the pellets. 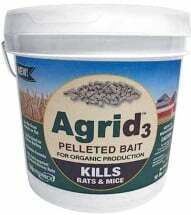 Place a small amount of pellets (1-2 Tbsp) at intervals of 8- to 12-feet apart in infested areas. Use a tamper-resistant Bait Station to keep out of reach from children, pets and livestock. Ultrasonic devices will keep mice out of a designated area. These products produce sounds that are inaudible to humans or pets and each unit provides up to 400 sq ft of indoor protection (one per room). 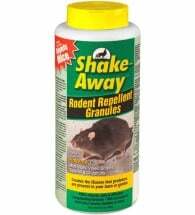 Non-toxic repellent place packs and organic granules use essential oils to keep rodents away from treated areas. Best of all, you don’t have to be concerned about finding dead animals in hard to reach places like attics, basements or behind walls.